If you're interested in Plato, you're reading the wrong book. If you're interested in difficult childhoods, sexual misadventures, aesthetics, cultural history, and the reasons that a club sandwich and other meals—including breakfast—have remained in the memory of the present writer, keep reading. In this memoir, dancer, choreographer, and filmmaker Yvonne Rainer traces her personal and artistic coming of age. 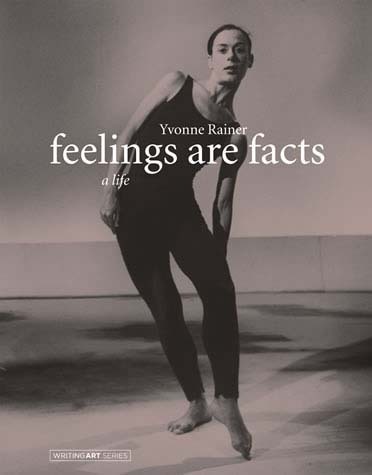 Feelings Are Facts (the title comes from a dictum by Rainer's one-time psychotherapist) uses diary entries, letters, program notes, excerpts from film scripts, snapshots, and film frame enlargements to present a vivid portrait of an extraordinary artist and woman in postwar America. Rainer tells of a California childhood in which she was farmed out by her parents to foster families and orphanages, of sexual and intellectual initiations in San Francisco and Berkeley, and of artistic discoveries and accomplishments in the New York City dance world. Rainer studied with Martha Graham (and heard Graham declare, "when you accept yourself as a woman, you will have turn-out"—that is, achieve proper ballet position) and Merce Cunningham in the late 1950s and early 1960s, cofounded the Judson Dance Theater in 1962 (dancing with Trisha Brown, Steve Paxton, David Gordon, and Lucinda Childs), hobnobbed with New York artists including Robert Rauschenberg, Robert Morris (her lover and partner for several years), and Yoko Ono, and became involved with feminist and anti-war causes in the 1970s and 1980s. Rainer writes about how she constructed her dances—including The Mind Is a Muscle and its famous section, Trio A, as well as the recent After Many a Summer Dies the Swan—and about turning from dance to film and back to dance. And she writes about meeting her longtime partner Martha Gever and discovering the pleasures of domestic life. The mosaic-like construction of Feelings Are Facts recalls the composition-by-juxtaposition of Rainer's work in film and dance, displaying prismatic variations from what she calls her "reckless past" for our amazement and appreciation.